The New Year is coming and with it the inevitable List. I’m so naturally predisposed to jotting down self-improvement principles that I was rather taken aback to find another, famous, list maker, in comparison to whom my yearly principles appear soft and fluffy, like a cappuccino foam. Not at all like Tolstoy’s Rules of Life, a lifelong obsession, according to his biographer Henri Troyat. 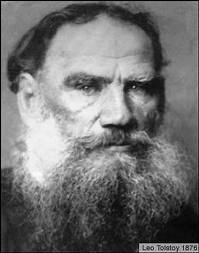 Tolstoy’s Rules procreated so rapidly and to such excruciating detail that the only thing more painful than the Rules was the self-castigation Tolstoy inflicted upon himself as he proceeded to violate each and every one of them. Reading Troyat’s biography, I couldn’t help thinking that in Troyat, Tolstoy had met a formidable match. Troyat unforgivingly places Tolstoy’s pettiness, selfishness, hypocrisy, martyr-complex, hypochondria, misogyny, and remarkable self-centredness, in plain contrast with his Rules (though, to be fair, some of these, like misogyny, are explicitly mandated by the Rules). It is as if Troyat were Tolstoy’s externalized conscience, pointing to his inconsistencies and contradictions at every turn. As I read on I felt increasingly indignant until I thought about what my own life would read like if someone like Troyat combed through it, re-reading and analyzing my old Lists full of principles and rules I can no longer even remember. It reminded me that the List exists because of the discrepancy of ideals with reality, and as such makes each one of us a hypocrite. Toward the end of his life, Tolstoy’s Rules finally morphed into a full-fledged religion – Tolstoy was now making not just Rules for himself but for the whole world, feeling more righteous and divinely-inspired along the way. A vulnerable human hoping to become a better person had turned into a prophet prescribing rules to humanity. We should be grateful to Troyat for highlighting how easily means of self-improvement can become a club with which to beat the world. Troyat, H. (1967). Tolstoy. New York: Doubleday and Company. "A vulnerable human hoping to become a better person had turned into a prophet prescribing rules to humanity." This would accurately describe the trajectory of every prophet that ever lived, including Jesus and Buddha. In fact, if these last lived in our time, they would probably receive a fair amount of criticism, just as much as Gandhi or any modern man. It is only that they are so far past that we do not know of their flaws or insecurities. "We should be grateful to Troyat for highlighting how easily means of self-improvement can become a club with which to beat the world." Writing about one's beliefs in an attempt to reform the world's moral constitution is not quite akin to clubbing the world. I don't necessarily agree with all of his writings, and it's clear his moral views developed out of a hasty spiritual awakening, but they could hardly be perceived as being so aggressive and malicious as to warrant the image you chose to portray it.